Dr. Michael Fetner has been a practicing periodontist since 2013. 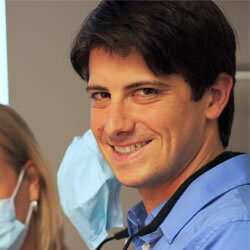 He graduated from the University of Florida, Gainesville for his undergraduate, dental, and periodontal degrees. He received his board certification in periodontics in 2015. During his periodontal residency, he was elected chief resident in his third year of residency. In 2013, he was awarded the prestigious Richard Lazzara Fellowship in Advanced Implant Surgery, which enabled him to continue his dental implant research. He is an author in two dental implant research papers. Dr. Michael Fetner continues to give back by teaching at the University of Florida Graduate Periodontics department once a month, as well as working with various charities to treat the underprivileged. He and his wife Sondra have a son, Gideon, and a daughter Quinn. You may meet them walking or biking with their family through Avondale, where they call home.